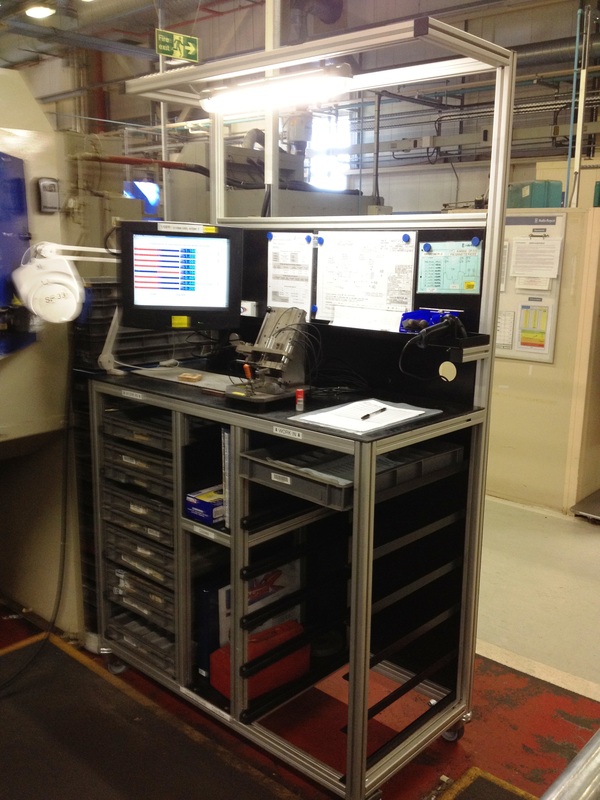 Design and manufacture Inspection Desk to drawing number 2012-02-9024. The desk framework is assembled from 40mm x 40mm heavy duty extruded aluminium profile and fitted with 100mm diameter swivel and braked castors. The interior framework of the table will consist of two tray rack sections, a toolbox shelf and A4 folder compartments. The up stand back is manufactured from mild steel and powder coated to give a hard wearing durable finish and feature a 160mm deep shelf. The mild steel table top is covered in 3mm black rubber. A full motion cantilever monitor bracket which can be raised and lowered as well as moved in and out has been fitted to one of the two corner posts. A 4-Gang Surge Protected extension lead is located on the back of the up stand to provide power points which can be accessed from 2 cut-outs in the rear up stand. There is also a 620mm long brushed aluminium finish strip light fitted to help with inspection of parts (Lux output for a 600mm fitting is 1200) and a bar code gun holder. Approximate overall size 1250mm (W) x 620mm (D) x 2100 (H) (table top height is 1100mm).